I feel the pressure—the urgency. With my weighty time in nature I barely saw a monarch butterfly here or there during my summer outings. And in August and September there was not a caterpillar in sight on my butterfly milkweed–the plant that is most important to sustain their future. Truly, it’s more than worrisome. Reports continue about the monarchs free fall, and their misfortune is only one among countless others. Nature works hard and tirelessly to create and develop symbiotic relationships. One of those is the partnership between the Monarch butterfly (Danaus plexippus) and the Butterfly Milkweed. 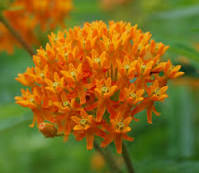 Fortunately, this perennial is native to Delaware: we have two varieties, Butterfly Milkweed (Asclepias tuberosa) and Swamp Milkweed (Asclepias incarnata). For this post I will focus on the former. Asclepias tuberosa’s heavily clustered, orangey-flowered plant acts as host to this butterfly’s life cycle. 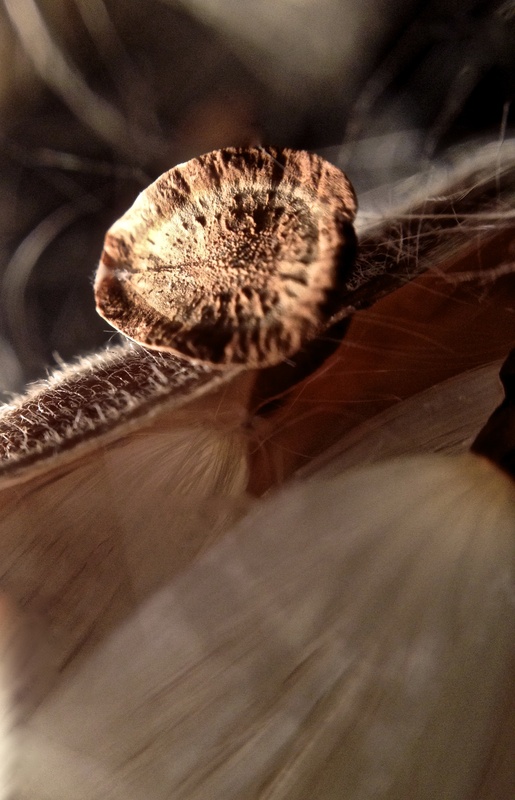 So I dedicate this post to the seeds and silks that carry the plant’s survival kit. 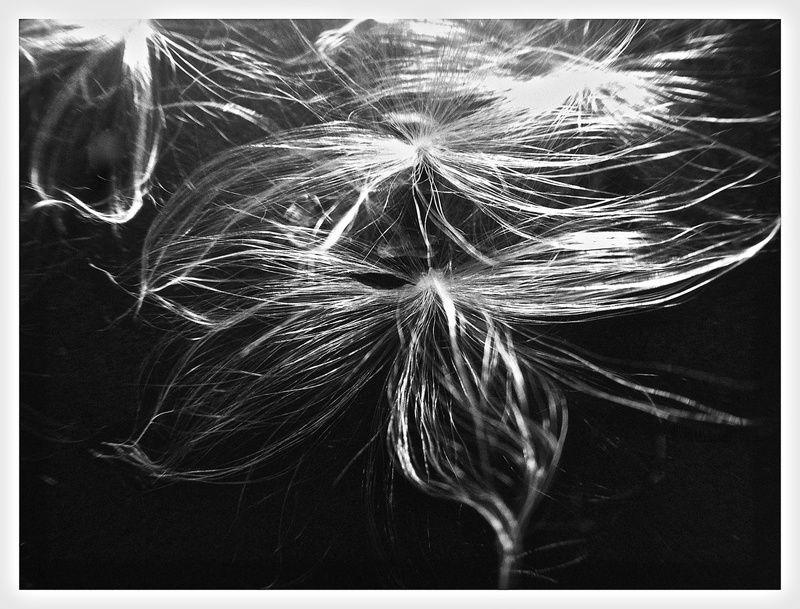 In the Lens section is an image of the silk that acts as parachutes to carry the seed to unknown destinations. The second image shows a seed that measures approximately 1/8″ long and seems flat to the naked eye, but the macro tells us a different story. Every year I add these perky plants to my gardens, experimenting with exposures and location. Finally, I have two divergent sites (east and south) that are producing both greenery and flowers. During this gardening season seedpods were numerous, and the silky threads have been landing with their usual quietude. Suddenly, I find them tied around some unsuspecting neighboring plants or distant areas. They encourage my hopes that the more produced, the more chances for the monarch to continue its longevity. 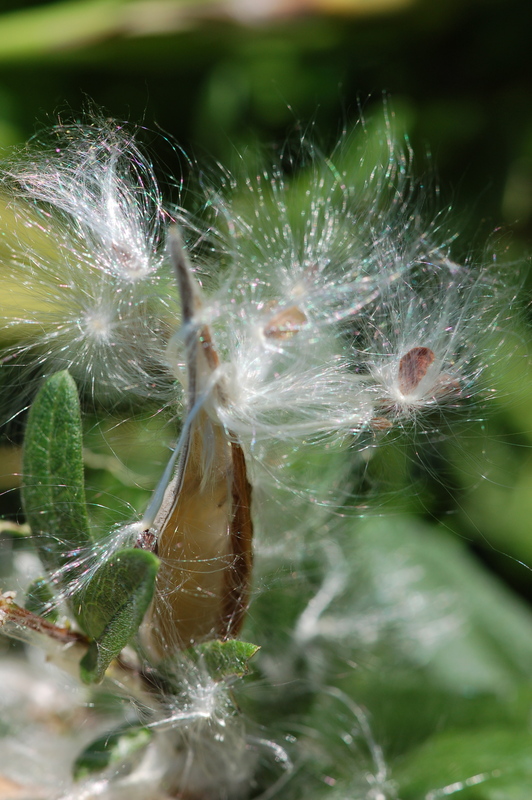 While the decline of monarchs is very much connected to human intervention (loss of prime habitats as well as ramifications of climate change), I’ve also read that there is a tendency for some people to view the milkweed plant as a weed: meaning that they work to eliminate it. In my part of the universe we revere this native. So I’m hoping to spread the word: plant and maybe they will come. Tip of the Week: While my snail mail has been reduced to a minimum, the monthly arrival of National Geographic Magazine is a glorious visual gift. This publication can be read online (http://ngm.nationalgeographic.com), but I prefer a slow read on my screened-in porch where nature floods inside with songbirds’ melodies and sunlight’s gaze. The October issue astounds: the “125th Anniversary Collector’s Edition, The Photo Issue.” Since 1888 viewers have been privy to the glory of our planet through the organization’s efforts. The photograph has been integral to the NG’s ability to celebrate humanity and nature–the interwoven story. I encourage you to get a copy, which can be bought in bookstores (if you can find one) and newsstands (if you can find one). Or subscribe online or by snail mail. This entry was posted in Black-and-White Photography, Photography, Writing and tagged Butterfly Milkweed, Inspiration, Mobile Photography, Nature, Photo Challenge, Photography, Writing. Bookmark the permalink. Nicole, I’m humbled. Thanks so much. A perfect vision to start my day! Have a great week ahead. That’s so lovely–see you soon. Thank you so much. As always you pictures are gorgeous. My favourite this time is the first one, the black and white image. I just like the structures and the fluffiness of the silk. Wonderful light. Otto, thank you so much. Excellent post. We are on the monarchs’ migratory path and see so many – have not noticed fewer this year but worth checking it out with our naturalists. Tina, I’m glad that you have not seen a drop in their population. Maybe next year will be better in my area of the country. Thanks. These are just beautiful Sally. I live the warm tones in the second image. Edith, thank you. See you soon. You may remember some of my posts (during our last summer) when I had a very successful monarch butterfly season. It was the first time I had planted specifically for the monarchs and I was astonished by the results. Some of the late hatching monarchs must have hibernated during the winter because I was surprised to see some this past weekend. I don’t know what sustenance there is for the butterflies at this time of the year. I hope they are sheltering well tonight because we have a sudden return to winter-like conditions. You make me so happy. I’m hopeful that they’ll be back next year. See you soon. And, thanks for the tip about the NatGeo 25th edition of photography. Should be a great read/viewing. #1 .. love the silky threads that are showed up so well by the contrast of black and white. 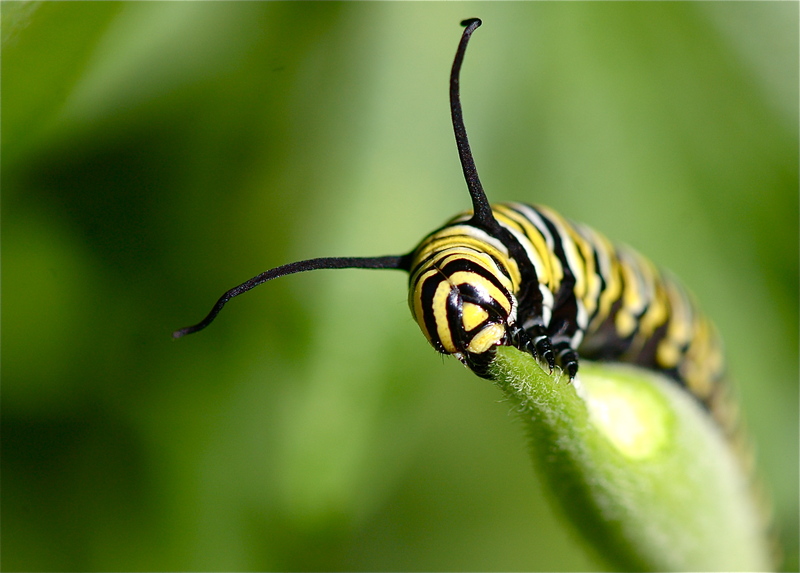 The story of the monarch butterfly and the milkweed is interesting. I was always fretting about the mealybugs that keep reappearing in my few meagre pots of plants… and routinely sprayed the plants with neem oil. I am humbled by your efforts to grow plants that sustain the monarch. Thank you, great that you are using neem oil, because it is plant-based. See you soon. Wow, interesting – what kind of phone do you have to capture such beautiful pictures? More interesting – what beautiful eyes you have to see such beauty!! I’m humbled. It’s an iPhone 4s. Thanks so much. My favorite is the black and white, although I do like the second picture too! Linda, see you soon. Thanks. Welcome to the challenge. Thank you so much for your comment. And the declining biodiversity is surely worrisome! Let’s hope things improve soon. It is lovely that we had similar subjects–spent flowers can be so inviting and lovely. Thanks for your comment. You’re very welcome. Thank you. Surprising or not I did caterpillar and milkweed today, too. No matter what the subject today I was going to post my caterpillar. Amazing that we had the same subject for today’s challenge. Delighted to have you part of the weekly challenge. Yes, it is more than worrisome the state of the environment and its domino effect. Thanks for the comment. Polly, thank you for your thoughtful comment. Phoneography Challenge: Nature | Steve Says…. Steve, I appreciate your comment. The top image is stunning and literally could be made into a piece of art. Laurie, thank you so much. I’ve only seen a couple of Monarchs this fall, and no caterpillars on the milkweed. I even planted extra this year. I’m keeping the butterfly nectar feeder out, in case any weary travelers stop by. I forgot to vote for the photo, I like the contrast in the first, the details pop on the dark background. Patti, those silky threads are wispy and fun to watch. Thanks. Our hummingbirds left a week ago, onward to their winter habitats. Interestingly, their population seemed to increase this year. Thanks. It is so Important to take care of the environment. One of the resons are that without all our pollinators there will will be no food for us…If we cannot take care of the environment for it´s own sake we should at least do it for a selfish reason! Beautiful pictures both of them. I cannot choose. Lena, you know that I agree with your comment about the environment. I believe that it should be our number one concern. Thank you so much. I love what seems to me like a surprise exploding in that first photo. I prefer the 1st photo for the simplicity of B&W and the composition. What a great post! Your photos are truly beautiful (I love the fist one especially) and the piece you have written is very interesting – and passionate!. We haven’t seen many butterflies of any kind here in the UK this summer, except an abundance of Cabbage Whites, but little else. You have made me see if I can get some milkweed seeds and see if they will grow here – it can’t hurt to try after all. Even if I can’t encourage some Monarchs, the bees might be interested? Thank you for a wonderful and inspiring post! Absolutely, we also have had an abundance of cabbage butterflies. Tried to grow purple cabbage. Rigged a netting, and lo and behold one white cabbage butterfly got inside the netting and ate to its heart’s content. I appreciate your comment. Thanks. I like the ethereal quality of the first photo, but there’s such lovely texture in the second that I think I’ll go with a toss-up. Bees are also a threatened group so I’m always pleased when our plants attract them. At our old house, I’d planted lavender and the bees loved that. Hopefully I can find a place for some at our rental, although it’s pretty much landscaped full. Janet, glad that you also are a gardener. We play an important role for the wildlife. Thanks.